My mother understood my reasons for wanting to quit, but told me that I shouldn't worry about what other people say. It wasn't just because I was being teased that I decided to quit my twice weekly ballet classes. It was taking up too much of my time and I felt like I was just growing out of it. Plus, taking it beyond Grade 4 is something only prospective professionals tend to do... and my waning interest no longer justified the time, effort or expense of continuing. I'd also found new interests that I enjoyed more, such as playing cricket, making model kids, going karting and playing video games. One afternoon at school, Miss York, my English teacher asked if I'd stay behind after class. Initially I thought that I must be in trouble for something, so waited nervously whilst the other kids filtered out. Miss York is also the school's Head of Drama. She tells me that she's looking for cast members for the big play that's performed at the end of the academic year, and asks if I do ballet. “No.” I reply. “Not any more.” I added, informing her that I gave it up a year-and-a-half ago. “But you'll still know some steps?” she asked. "I'm not looking for Wayne Sleep." she said. I tell her that I'm not much of an actor and don't have much interest in drama. "...and my ballet's really rusty." I add. “Yes.” I groan. I'm less than impressed. “Half the kids already call me Billy the ballerina because I used to do ballet.” I told her. “I've been trying to shake that nickname off since junior school.” I moaned. “It'll give you the chance to demonstrate how skilful and physical ballet is... if anything it's to challenge the stereotype that dance is just for girls... just like Billy Elliot did.” She's very persuasive and since there's no one else in the school to play the part, I reluctantly accept. We rehearse for weeks and liaise with the woodwork and art teachers when designing the set. The stage will become a classroom set with chairs and desks set out in rows. The play is set during a really boring class and each student drifts off has a dream sequence. These are depicted on a raised platform above and behind the classroom set and will be performed by a 'dream-double'. They've built some really impressive sets depicting an operating theatre, a space station, a racing car, a building site, etc. which can be quickly erected and removed in between each dream sequence. There's also a back projection to give the sequences a more cinematic feel, although my sequence doesn't involve any props other than a bar and a big mirror. It's been over eighteen months since I quit ballet so I feel more than a little rusty... but the rest of the cast are really impressed with my dancing. None of them could do it and all of a sudden, I feel proud to be part in this year's school play... not to mention proud of myself. Then, two weeks before the performance, John Sully, the boy's who's dream I'm performing has to have his appendix removed and will be off school for about three weeks. At this stage in the rehearsals it's disastrous to lose a key player and Miss York is struggling to find a replacement for him. The last thing the drama teacher wants is to drop my scene, and I don't want that either... especially after all the work I've put in. I'd resurrected my daily stretching routine which involves thirty minutes in the mornings and evenings as well as practising my steps at home too. After a few days of not knowing if I'm going to be part of the play, Miss York gives me some 'great news'. She's found a replacement for John but since his last minute replacement is a girl called Kelly, some minimal changes need to be made to the script. Instead of the scene being about a boy dreaming of becoming a ballet dancer, it's a girl dreaming of becoming a ballerina. “But... I can't dance like a ballerina... it's completely different... it'd mean changing the choreography and everything.” I state. “She'd need a hair cut.” the drama teacher said. “And I doubt she'd be willing to do that just for one small part in the play.” she claimed. “Possibly... but she is very pretty... even with a wig I don't think she'd be very convincing.” Miss York replied. “I know it's a big ask... but you've put so much into this already, it'd be unthinkable to find a girl who does ballet to replace you.” she said. “Two minutes in a tutu. That's all it is.” she assured. Reluctantly, I agreed to go along with the changes. I did change the choreography a little to make it a more convincing routine for a ballerina. I dug out my old DVDs of the Bolshoi Ballet doing Swan Lake and the National Ballet's Nutcracker and focused on the ballerinas. I wasn't too happy about changing my choreography at this late stage but... if I’m going to do it, I want to do it properly. It was only as we prepared for the full dress rehearsal that I began to wish that I’d never agreed to the changes in my script. As a ballet dancer, I was only going to wear shorts and a T shirt but now I’m playing a ballerina I have to wear a pink leotard with a big pink pancake tutu which means everyone can see my bum regardless of whether I bend or not. In addition I'm wearing pink tights, pink shoes, full make-up, false eyelashes and a tiara. Even Miss York couldn't help but snigger when she first saw me in costume. Everyone did. My boyish hair is scraped into the tiniest ponytail, held with a bobble, hairpins and hairspray before a fake bun was pinned in place. A pair of magnetic diamanté earrings completed my costume. “Are you nervous?” Miss York asked as I shyly loitered back stage. I gulped and nodded. “Well don't be... you look amazing and I'm sure your routine will be spellbinding.” she claimed. It'll be anything but! I might have reached grade 4 so for a twelve year old, I'm not a bad dancer... but that was ages ago and in spite of returning to my morning stretching routines and practising my arabesques and pirouettes, my chasse, saute and jete on a daily basis... I really don't think I'll be convincing as a ballerina. Boy's are taught differently to girls and I rack my brains trying to recall how our dance tutors used to coach the girls. It's subtle differences like the angle of our wrists and ankles, they way we're supposed to hold our heads. Girls deliver their steps with a level of grace that the boy's can't achieve, so the boys tend to be more assertive in their approach. I never learned to flutter my fingers and wasn't confident on pointe; a technique that I'd only just begun a few months before I quit. Whilst I’ve had a couple of months to bush up on my ballet, I've only had two weeks to learn to dance like a girl! There's nothing to do but limber up and linger whilst the other cast members are getting ready. At least all the other boys are wearing stage make-up too so I'm not the only one feeling shy and sheepish. But unlike mine, there's isn't so distinctly feminine. Some rehearse their lines, others chat in groups. The back stage crew scurry around and I find a quiet corner to do my final stretches and last minute practise. The stage manager (one of the fifth year students) eventually tells everyone to be silent back stage. “Dream doubles in the wings please.” he says. I and the others make our way to the wings, our nerves increase with every step. “Who?” Robert asked as a teacher told us to shush. “She's a famous ballerina.” I said in hushed tones. “So are you.” Mark sneered. I gulped and glanced at the girls. Rose rolled her eyes and cast me a supportive smile. Mary mouthed 'ignore him' whilst Susan faffed with one of several hoses that hung from her costume. I look out to the stage and its schoolroom set. It's in darkness apart from a spotlight on Emily who's dreaming of becoming a teacher. On the platform above, her dream is being acted out by Teresa. Heard but unseen from my vantage point in the wings. Eventually Teresa exits the platform and the stage is fully illuminated once more. She rejoins us and despite that fact we could only hear her performance, we silently congratulated her on a 'great' performance. The classroom skits in between our 'dream' performances are quite funny. They tease both teachers and pupils, poke fun at the national curriculum. The spotlight soon focusses on James and Mark's performance as a racing driver begins. The sound of Fleetwood Mac's The Chain booms through the PA speakers along with samples of formula one cars, speeding and skidding around the back-projected racing track. Butterflies burst into my belly because it's my turn next. I focus on my routine, visualise the choreography, make sure I'm warmed up by putting my palms flat on the floor (making sure the other members of the cast don't see my backside) before propping my ankle on the waist high rail and reaching out over my leg. I repeat on the other leg, knowing full well that they're all staring at me. It is humiliating but I'm not going to dance without being properly warmed up. “That's really impressive.” Teresa exclaimed under her breath. “How do you do it?” she asked. “Lot's of practice.” I replied as I put myself on point for a brief moment. Mark's sequence ended and he returned to the wings holding a huge papier-maché trophy and wearing a big paper laurel wreath over one shoulder. We congratulated him as we'd done with Teresa and after another quick stretch, I took a deep breath before making my way to the stage. I felt a couple of encouraging pats on my shoulders before I made my way up to the platform on which I’d perform my dance. This would have been nerve racking enough if I was dressed like Billy Elliot... I’m practically crapping myself as I climb the steps in the darkness and take my place on the stage where I adopt the first position. I wait nervously for the spotlight to shine on me and my music to begin. I remain completely still and foresee my routine whilst my nerves almost shake me off my feet. All of a sudden, my eyes are filled with light and my ears are filled with the opening notes of Tchaikovsky's Nutcracker suite. I breathed into my diaphragm and began. The two minute routine incorporates music from the Nutcracker, Swan Lake, Sleeping Beauty and Cinderella. It's not long but when you're dancing, knowing that everyone is watching and you need to do your best, two minutes is a life time. All the time I'm prancing and dancing, spinning and leaping, I'm telling myself one thing... 'don't mess up the point work' ...it's only a short sequence on tip-toe but people underestimate how hard it is having your entire body weight on the very tips of your toes. The adrenalin builds. I feel the fire inside glowing brighter and hotter as the dance takes over. It's cheesy I know but Billy Elliot was right... it feels like electric. My routine ends right on queue to a lacklustre applause. I expected more to be honest. I perform a huge dramatic curtsey before rising and gracefully stepping forward. On the stage below, Kelly should be picking up a bouquet of flowers which she'll hand to me. I reach down and take it, hold it like a ballerina should, curtsey once more and the spotlight dims. Finally, with my heart and lungs pounding, I exit the stage. My fellow cast members tell me I was brilliant... well, the girls do, but I know they couldn't see anything. I thanked them all the same. I'm glad it's over and glad that I didn't fall, twist my ankle or mess up the point-work. Although in a way I wish had twisted my ankle. This is only the dress rehearsal... tomorrow I'll be doing it in front of the whole school and their families! I want nothing more but to go and change out of my costume, but I stay in the wings with my fellow cast members until the end of the play. I may be the only ballerina but I'm not the only one who's nervous about their performance. Once the rehearsal was over, the drama teacher pulled us up on a few minor details but on the whole, said we'd done and excellent job. Later, she took me to one side and said I was amazing. “Nobody would guess that you're really a boy.” she said. “Yeah maybe.” I said. Most likely they'll be focusing on the boy dressed as a girl thing... they won't even notice the routine that I've strived so hard to carry off. I got home and Mum asked how the dress rehearsal went. “OK I guess.” She questioned why I sounded so glum. “There's something I’ve been meaning to tell you... about the play.” I said. I guess I’d hoped it'd be cancelled or maybe I would twist my ankle today, but the show still goes on and it's time I told my Mum that John dropped out now Kelly's playing his part. “...well... not 'his' part... 'her' part.” I gulped. “Which means I’m not playing Billy Elliot but a Ballerina.” I confessed. “That explains your make up.” Mum said. I felt myself blush. I had washed it off but traces of foundation, eye shadow, blusher and lipstick remained, she informed me. “A tutu too I hope.” Mum grinned, before asking when John dropped out and why I didn't tell her. I told her and she assured me that she wouldn't have been mad, before prompting me to describe my costume in detail. Mum's enlightened grin had become permanent. “What colour?” she asked. “The whole costume is pink... baby pink.” I said as Mum gasped. It was almost as if she'd stopped breathing for a few seconds. “I dunno... probably not. The girls said I looked 'cute' and the boys said I looked like a fag.” I informed her. “Oh it's just stage fright and last minute nerves... I'm sure you'll be perfect.” she assured. The next day is the most nerve racking day of my life. With the school year coming to a close and only the end of term to look forward to, I and the other members of the cast and crew spend much of the afternoon preparing for tonight's one and only performance of this year's school play; Dreams and Aspirations. We fill the school hall with chairs, over six hundred of them! Cast members rehearse their lines, the school band rehearse the music, the prop builders frantically finish the finer details if the various sets. Its busy, almost frantic. I have little time to worry because there's so much to be done. The school bell rings at 3.15pm but we're not going anywhere. After a buffet supper, it's time for all eighteen cast members to get into costume. The gods must be looking down on me and laughing because I'm one of the first to called. “Already!” I whine as I make my way backstage. It's only just gone 4.00pm and they play starts at 7.30pm. By 4.30 I'm ready. The drama teacher reminds me not to touch my face and definitely don't rub my eyes. I have an embarrassing three hours to look forward to... knocking about in my baby pink leotard and tutu. The girls coo and snigger. The boys just snigger... especially when I’m limbering up and practising my pirouettes. “Oi Billy... you're showing your arse!” Brian taunts. In a pancake tutu, I can't do anything about that. I can't even hang my arms casually by my sides thanks to its broad horizontal disc. They're either folded or I'm stood with my wrists gently brushing the perimeter of my tutu. At some point over the next two hours, seemingly every one of the kids involved with the play ask me why I’m stood like I am. The drama teacher gathers us all together for a pep talk. Those of us performing the dream sequences must remain deadly silent whilst we're waiting in the wings. “Can we get changed once our skit is over?” I asked, hoping that I'd be able to get out of this ridiculous costume once and for all. “Really miss?” I groan as some of the others snigger. “After we've got changed?” I asked. “No... in costume.” she replied. I sighed. I only signed up to wearing it for a couple of minutes on stage. If I'd realised I'd be wearing it for half the afternoon and most of the evening, I'd have had even more second thoughts. The fact that everyone else will be in costume is no consolation. I'd happily wear Susan’s space suit or Mark's racing driver outfit. Even Teresa's blouse, pencil skirt and stiletto heels would be preferable to my costume. At around 7.00pm, the audience begin filtering in and filling the chairs. All of us involved are getting nervous and not a single one of us wants to mess up our scene. A cacophonous chatter echoes from the hall; hundreds of voices all talking at once. Our nerves increase as we rehearse our lines and routines one last time. I stretch and limber my muscles and tendons, practice my arabesques, plies, pirouettes and jettes. The lights dim. The audience falls silent. The old Grange Hill theme blasts through the PA and play finally begins. The audience laugh at the classroom skit. We tell Teresa (the first to perform a dream sequence) to 'break a leg' as she makes her way to the platform above the stage. The audience coos as the lights dim and her scene begins. We'd all had chance to watch each other's scenes during rehearsals and the combination of lighting, music and back projections is really quite impressive... for a high school play any way. Mark's noisy racing driver scene means I’ve only got a few more minutes in which to quell the hoard of butterflies in my tummy and prepare myself. “Does my make-up still look OK?” I quietly ask Teresa and Rose. They assure me it does just as Mark returns with his trophy and laurel wreath. We congratulate him and it's my turn next. “Break a leg.” they say as I prepare to take my position. “I was hoping I'd do that last night.” I said in a shaky voice before making my way through the darkness, up the steps and onto the dark platform. As I begin to dance, the last thing on my mind is my pink tutu and feminine make-up. I have to concentrate on getting my steps perfect, on being completely balanced, on moving with the music, anticipating the segues between the Nutcracker suite and Swan Lake, Cinderella and finally Sleeping Beauty. I flows through my ears and out of my limbs, conducting every moment of my well rehearsed routine. Arabesque to the left, a petit jete to the right, a pirouette on demi-pointe brings back to centre stage. I chasse this way and chasse back. My weightless tutu bounces around me, but not so much that it would ever cover my backside. Another arabesque and a pirouette back to centre stage where I perform the hardest part of my routine; the pointe work. I raise my arms to the fifth position as I rise into the very tips of my toes. Step, step, passe, passe, step, step arabesque, down, sissone, sissone, back to pointe, step, passe, step, passe, pirouette and finally stop in the fourth position. The music stops right on queue and a huge applause erupts from the audience. Thankfully I'm facing them. I hold my position and take a deep breath. I curtsey then step forward and reach down for my bouquet. In the stage bellow, Kelly climbs into a desk and passes it up to me. “Aaahhh.” the audience coos in unison before clapping once more. I return to fourth, curtsey again and my spot light fades. I breath a huge sigh of relief as I descend the steps and return to the wings. There's still another forty minutes of the hour long play. We loiter silently waiting for the curtain call. I've been dressed like this for almost four hours now and all I want is to be able to hold my arms normally. If my tutu wasn't part of my leotard I'd take it off. I perch myself on a box, making sure there's space behind for my tutu. Teresa joins me and pulls off her heels. “These are killing me.” she whispers as she rubs her feet. “Are they hard to walk in?” I ask. I gulped and felt myself blush. “Thanks.” I said as we were hushed again. She pushed her toes back into her shoes, took hold of my hand, squeezed it gently and smiled a reassuring smile. She let go and we sat in silence whilst the play progressed. It's a long wait for the end and David Bowie's Space Oddity marks the final dream sequence. “I wish I was in the audience for this bit.” I whispered to Teresa. We'd seen it in rehearsals and the ISS model and ISS set looked great with the star scape back projection. It'll look ten times better with the lights down. “Neither could I until yesterday.” I quietly replied. “Didn't you wear one when you did go to ballet?” she asked. “Boy's don't wear tutus.” I informed her. “Well... not normally.” I said. The music from the stage began to fade so we ceased talking. Susan's performance ended and after one final classroom scene, the curtain came down to a riotous applause. The kid who played the school teacher took the first curtain call, followed by the kids who'd played the pupils. Then one by one, those of us playing their dream doubles take the stage one final time; Teresa first. Then Mark with his trophy and laurel leaf. Then me with my bouquet of flowers. I performed a big dramatic curtsey and am given a second bouquet. I wasn't expecting that! I take my place with the others and stand smiling as Mary, Brian, Rose, Robert and finally Susan take their curtain call. Susan gets by far the biggest applause because her space station scene is by far the most impressive. I'm a bit annoyed when she takes a bow... but I guess performing a curtsey in her spacesuit would be quite difficult. The stage crew take to the stage and get another round of applause, followed by Miss York; writer, director, drama teacher. The curtains closes. The applause continues. The curtains open once more and we bow and curtsey on last time. I glad it's all finally over. But I know it's not. “It was a last minute compromise... it was either that or drop the scene altogether.” Miss York told them. 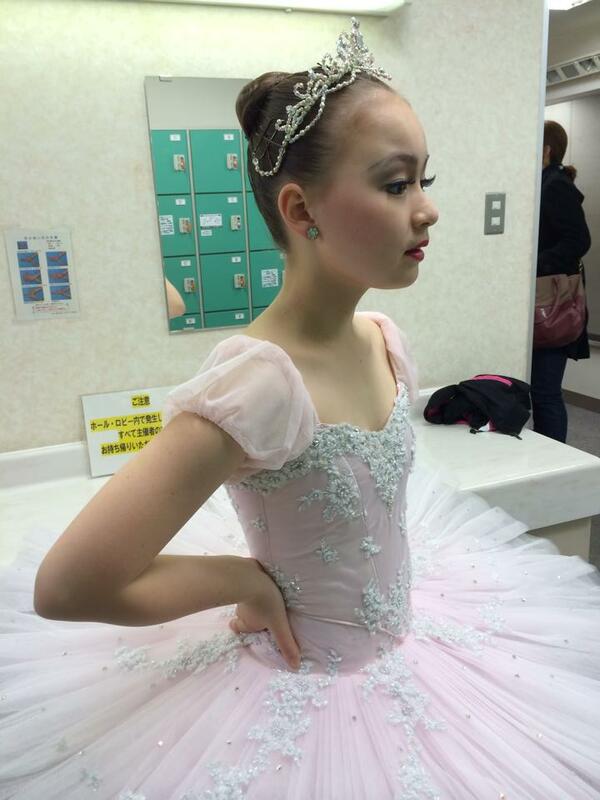 She explained that in she wanted to challenge the stereotype that ballet is for girls, “...a bit like Billy Elliot. Having a girl dreaming of becoming a dancer felt like a cliché but, that's what we ended up with.” she smiled and looked me up and down. “Having a boy play the ballerina does challenge some stereotypes.” Mum replied. They both cast their eyes over me. “Yes I suppose it does.” Miss York smiled. “I hadn't thought of that.” Everyone seemed to just stare at me for a few seconds. I've had this costume on for about five hours and there's no getting used to how exposed it makes me feel. “Are you cold?” Miss York asks. “No I er... just don't know where to put my arms.” I replied. “I can only stand like a capital A for so long.” I told them as I demonstrated the only alternative to folding my arms and huddling myself. They chuckle. I suggest putting a couple of holes in the tutu to put my arms through. They chuckle some more before the small cluster falls silent. I glanced around and Teresa caught my eye. She beckoned me over so I sheepishly sauntered over. She was chatting with Rose and her parents but left them to meet me halfway. “I can't get used to you being that tall.” I said. Her heels must be at least three inches high, putting her a good two inches above me. “How tall are you when you do that tippy-toe thing?” she asked. “I bet you can't.” she smiled. “You've been flashing your bum to like... everyone!” she grinned. I grimaced and glanced around. “I know... I can't help it.” I replied. “...and on Monday at school, everyone's going to be like... I saw your bum on Saturday.” I whined. “Thankfully there's only one week of term left and they'll have forgotten about it after the summer.” I optimistically added. “Until they start editing the footage for the DVD.” she said. “I'm quite excited about it.” she added, before explaining further. Apparently they'd kept the covert cameras secret so we didn't get doubly nervous but it turns out that they'd put a number of 'action-cams' hidden on and around the stage in order to produce a DVD of the show. “You're kidding!” I gasped after learning that next term's media studies class will be using the footage to learn video editing techniques. I nervously glanced around as I imagined the footage of me not only being part of the curriculum, but probably leaked and put on YouTube too so my cousins and... I don't even want to think about it. Mum and Miss Corelli mingled with other parents and teachers. Everytime I scan the room to locate them, they seem to be smiling and gesturing in my direction. I imagine my mother is going overboard with how proud she is and how beautiful my performance was. Miss Corelli will be telling them that she's my ballet teacher and blah blah blah. Some of my classmates sheepishly sauntered over and took the micky out of my costume, before sort of complimenting my dancing. Some of the girls said I look better as a girl and said I looked 'cute'. I grimaced. “Well I'd have preferred it if John hadn't dropped out.” I said. “Well I did try to talk Miss York into making you play a boy.” I told her as I eased myself from under her elbow. “Neither was Peter.” one of my friends interjected before mimicking my current stance; a relaxed second position. “Oh... but you look ace.” she said. “So do you.” I replied. My eyes dropped to her shiny black stiletto heels and moved up to her nylon clad ankle. Her black tights are much thinner than mine. They're the sort a grown up would wear. Her knee length pencil skirt hugs her hips and ten she erupts into a billowing white blouse. Her skin is like porcelain and her lips evoke a deep red rose. She doesn't normally wear glasses but perched on her nose is a pair of shapely flat-lens spectacles. She really suits them. Her big bright eyes flicker from left to right. She tells me that I'm staring. “Sorry... you just look... really... tall.” I sheepishly mutter. “Er... it's not that easy.” I claim, nervously glancing around. “You can say that again.” Robert said, almost sneering at me. “But no.” he added, just before I had time to get offended. “I crept up the steps with the others and... you were brilliant.” he paused and fixed my gaze. “I still think you're a fag.” he spat. I burst out laughing. Teresa did too. “Only joking.” he grinned. “You might be playing a girl but...” he paused and gestured to his own attire; a Bob the builder inspired outfit that doesn't quite work. “...I think I'm one of the Village People.” he grimaced. “All we need is a cop and a biker, a soldier and an Apache.” Kelly chortled. Meanwhile, my mother was raiding the buffet. She called me over and pushed a plate of food in to my hands. Two sausage rolls, a trio of volovants (salmon, mushroom and prawn), a handful of crisps, a slither of pizza, a quarter of a dinky pork pie and several sausages on sticks with either cheese or pineapple. “Be careful not to get crumbs on your tutu Peter.” she says as I bit into a mini sausage roll. “Maybe not but I don't want it getting messy.” she said. I shrugged and said it doesn't matter, before biting into the sausage roll once more. Another crumb fell and I brushed it off my tutu. “Why would you want to buy this? !” I asked with my mouth still half full of food. “As a memento.” she replied. I didn't want to make a fuss there and then. There's enough attention on me as it is. The last thing I want is for everyone to know that my costume will soon be 'my' costume. After the buffet we mingle some more and thankfully most people begin to wonder off. I sheepishly saunter up to Miss York and ask her if it's true that she's selling off the costumes. “Yes.” she said, explaining that every few years they sell off the costumes and props to make room for the new props and costumes that get made for each school play. With two major productions a year (July and December) and limited space, they need to have a cull to make room, she explains. “Your mother's already bought that.” she tells me. “Can't you sell it to someone else?” I causally suggested. “Hopefully!” she said as my eyes opened to the size of saucers. Miss York explained that we weren't informed about all the covert cameras because the prospect of performing in front of an audience was daunting enough... knowing that we were being filmed from all angles would have only added to our nerves. “You can say that again!” I thought. I shrugged. Mr Bryant, the history teacher, complimented my routine. “Stunning considering.” he said. “Thanks.” I coyly replied. Since it's gone nine o'clock and there's only fifteen or twenty of us left lingering in the gymnasium, I ask my mum if we can we go soon. “It's not very professional to leave before your audience.” Mrs Corelli, my former ballet teacher said. “Most of the others have gone.” I stated. “Yes but they're not trained dancers like you are.” she smiled. “Won't you consider coming back?” she asked. “Well if you change your mind.” she said. “Oh what's this?” she said, peering over my shoulder. I turned to see Miss York the drama teacher approach. In her hands is the big bouquet I'd been given at my curtain call. “You forgot this.” she said, handing it to me. “It's just a prop isn't it?” I said as I took it. “No... the one Kelly gave you was a prop... this one you've earned.” she told me. “Oh er... thanks.” I shyly replied. If there's one thing worse than wearing a pink tutu, it's wearing a pink tutu and holding a huge bouquet of flowers. “Mum... will you hold these whilst I go and change?” I asked her, handing the bouquet to her before turning to Miss York and asking if could go and get changed. My mother replied before Miss York did. “I've got your things here.” she said. In her hand is my school bag and a plastic carrier bag containing my uniform and footwear. I asked for the carrier bag so I could go and change. “There's no need... you can change at home.” she said, glancing around the hall. “In fact I think they're eager to lock up.” she suggested, nodding towards the impatient looking caretaker who's pacing around and jangling his big bunch of keys. “Er... OK.” I said. “Can you hold these whilst I...” I handed my mother the bouquet and trotted over to Teresa and Rose. “We're gonna go now so... I guess I’ll see you both on Monday.” I sheepishly said. Teresa gave me a big hug and pecked me on the cheek. “We'll be the same height on Monday.” she smiled as she towered above me. “Not if I wear these.” I grinned, putting myself on pointe one final time. I felt like such a ninny as I exited the school wearing my baby pink leotard and tutu. The sun is soon to set on this warm July evening and the numerous plastic gemstones on my tutu and leotard glisten in it's final rays. They shine through the delicate layers of my tutu, enhancing it's pinkness. Mum insists on taking a photograph. “Oh Mu-um not another one.” I whine as she gets her camera out. She must have taken about fifteen at the buffet and god knows how many throughout the performance. I grumbled and posed for a couple of photos before asking where the car is. I can't spot it in the mostly empty school car park. “I know but it's embarrassing.” I whine. Mum pesters me to keep it on until bedtime and since it's Saturday, bedtime could be as late as 11.00pm or midnight if there's a film on. Normally it's about 10.00pm so enduring my tutu for another half an hour isn't the end of the world. “Can I least take these eyelashes off?” I ask. Mum nods and one by one, I carefully peel then off and finally, after a good five hours, my eyelids feel weightless once more. Mum and Miss Corelli settle in the sitting room. Thanks to my attire, the most convenient thing for me to do is kneel on the floor where the disc of my tutu is uninhibited. All they can talk about is the play and the various dream sequences. Thankfully it wasn't all about me. Teresa's teacher dream was the most amusing. She poked fun at teachers, pupils and politicians. Mark's racing driver was the most exciting with the back projection of a race track depicting fast corners, skids and near misses. Mine was 'beautiful', especially when Kelly handed her 'dream-self' the bouquet. Mary's surgeon was also full of humour as well as political comments and Brian's blundering civil engineer had the audience laughing too. Robert's builder was a slap-stick routine with plenty of mishaps, but Sarah's astronaut scene rightly stole the show. It was always the most visually spectacular which is why it was saved until the end. The space-suit costume, the massive ISS model and ISS stage set, the back projection and soundtrack and the 'I can do anything' message... it really did blow my whimsical dance routine out of the water! After a small glass of wine my old ballet teacher left, telling me once again that I was perfect and should seriously consider returning to her ballet class. “No I don't think so.” I coyly replied. “But thanks.” I say. She leaves and Mum tops up her glass of wine, before flicking through the photos she'd taken on her digital camera. “You didn't take loads did you?” I asked as she began showing me them. “I didn't even know they were making one until afterwards.” I stated. “I'm gonna be called Billy for the rest of my life now.” I whined. “Oh it'll soon wear off.” Mum said in an empathetic tone. “Don't you think it would have been boring playing a Billy Elliot character instead of a ballerina?” she asked. “I was crapping myself.” I claimed. “I guess I’ll have to wait for the DVD.” I sighed. I really like this one PJ! I especially like the exchanges between Billy and Teresa backstage and after the show. Perhaps there will be a sequel and Billy can try out Teresa's heels? The picture is great, too. Are you/were you a ballet dancer? I recognize the dance terms but don't know enough about ballet to know if you're describing a real routine or not. Thank you. No, I'm not a dancer by any stretch of the imagination... I looked up the names of the various steps in order to make his routine feel more like a ballet than a gymnastic routine. Not sure about a sequel... What I like about this story is that there's no punishment, no domineering mother or aunt, no 'petticoating' school, no impending 'genderquake' ...just some minor changes to the school play that puts him in a tutu. I'd like to believe it's his first and last time. This is a very enjoyable story, I could almost imagine something like that happening in real life. Though I would like to think that boys who are good at ballet would not be put off. It is naturally very physically demanding and skilful, a good role modal might be the Cuban dancer apologies I cannot remember his name. Glad you enjoyed it. Is the Cuban dancer Carlos Acosta?